Albert Pujols has played nine Major League seasons. 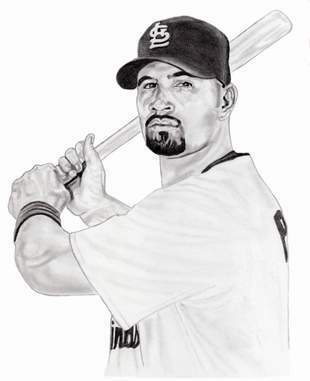 He was drafted by the St. Louis Cardinals in the 13th round of the 1999 amateur draft. In 2008, a poll of thirty Major League managers voted Albert Pujols the most feared hitter in baseball today. In 2001, Albert was supposed to start the season in triple A, but his great play in spring training and an injury to Cardinals third baseman Bobby Bonilla made the way for Albert to start the year with the big club as their third baseman. He also played first base, left field and right field during his rookie season. Pujols' fantastic season made him the unanimous choice for National League Rookie Of The Year. He batted .329 with 37 home runs and 130 runs batted in. The Cardinals moved Albert Pujols to first base for good in 2003. He responded by winning his first batting title with a .359 average. He also belted 43 home runs and 124 RBIs. Albert joined Rogers Hornsby as the only Cardinals to hit forty home runs and get 200 hits in the same season. Albert Pujols' current batting average is .334. He has already hit 366 home runs and driven in 1,112. He has played in eight Major League All Star games and has won five Silver Slugger Awards. Albert was the 2003 and 2009 winner of the Hank Aaron Award and received the 2008 Roberto Clemente Award. He was the 2003 and 2008 Major League Player Of The Year and has won the National League Most Valuable Player Award in 2005, 2008 and 2009. Albert Pujols led the National League in runs scored four times and total bases four times. And just for good measure, Pujols is a two time batting champion. Pretty impressive and Albert Pujols is far from finished.